People tend to shed their clothing when the temperatures rise — hello, bikini season! Unfortunately, pets can’t “take off” their fur, but you can help them stay cool with a cute summer cut. Contrary to popular belief, dogs don’t need drastic haircuts to stay cool in the summer sun. A dog’s fur — no matter if it’s long or short-haired — is designed by nature to keep a dog insulted in the summer heat. 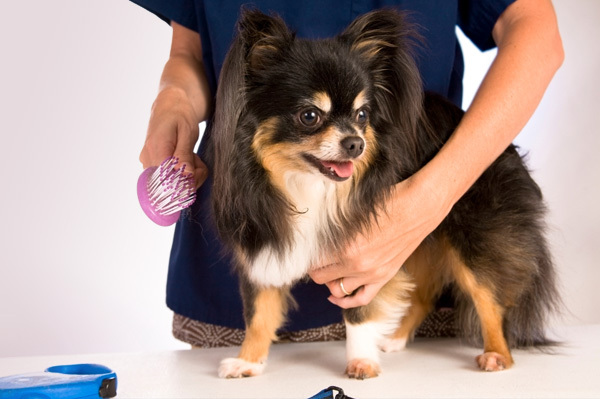 However, there’s no harm in keeping your dog’s fur tidy and trim — especially if you don’t want to spend the time to brush her coat every day. Need some inspiration? We especially love these summer cuts for dogs. The teddy bear cut is great for dogs over the summer because it retains some of the fur length while keeping it nice and tidy. Basically, this cut entails cutting the body fur to a short crop while leaving most of the length on the face. It’s especially adorable on toy breeds like Pomeranians and Yorkshire Terriers. The puppy cut is normally for puppies (naturally) and is designed to get little pups ready for regular grooming. Nothing really special to it — it’s just a short crop all over the body. Again, it’s good for toy breeds with fine fur, like Silky Terriers and Shih Tzus. Think we forgot about the grooming needs of bigger dogs? No way! The retriever look is great for bigger dogs with longer manes, and entails shaving the body fur to about an inch of length with even more shaved on the tail and head. The cut makes even the furriest dog (like a Husky) look like a Golden Retriever. This is for the rebel-without-a-cause pup who doesn’t care what anyone thinks. This cut — good for boy dogs — is similar to the retriever, save for a strip of hair down the middle of the dog’s body. This longer strip resembles a Mohawk, giving your pup a punk-rock look for the summer months. Salon grooming can get pricy, but we recommend that you put out the cash during the summer. Why? Well, dogs’ skin is particularly sensitive to sun, and accidently shaving your dog’s fur too close to the skin can put it at risk for sunburns and even skin cancer. A groomer knows when to stop cutting and can even recommend particular styles that best suit your pup. Worried about your dog’s skin during the summer months? Adams Plus Pyrethrin Dip for Dogs & Cats has added sunscreen to help protect your dog’s skin in the harsh summer sun. Epi-Pet Sun Protector is also FDA-approved to provide skin protection for dogs, but check with your vet to be sure what’s best for your pet.